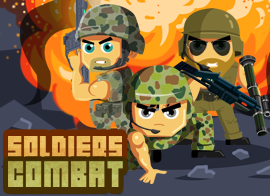 Soldiers Combat is an online HTML5 game and 100% of 24 players like the game. Soldiers Combat is an easy and interesting shooting game. You perform the task as a soldier in the game. Move and jump on the platforms. Shoot the boxes into pieces, collect the drop objects and coins, and collect 3 keys. You will encounter the enemies, shoot them with your gun. You can unlock new guns in the shop. Can you perform the task perfectly and finish the levels quickly? Good luck.